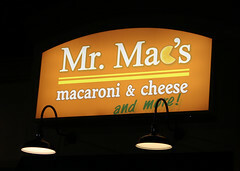 Mr. Mac’s, located on Route 3 just south of I-93 (in same stretch as The Puritan and La Carreta), Mr Mac’s is our local version of one of the newer food trends: the place that just serves mac and cheese. This isn’t a unique concept (for example, for the last several years S’mac in New York City has been putting out a mostly mac-and-cheese menu for discerning customers), but it’s one that fits in well in Manchester. 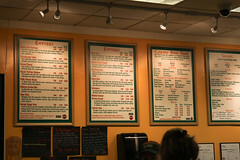 Basically, their menu is, well, mac and cheese, just with a large number of variations (sixteen, plus whatever specials they are running). From your classic mac, to tuna mac, to Buffalo chicken mac, to more elaborate dishes like a carbonara. With several different pastas (they’ve got multigrain and gluten free, for example), several cheese sauces, several mix-ins, and several toppings, they’ll also make up just about anything that they have the ingredients for, to order, and bring it out to your table, in sizes ranging from “small” (single serving) up to “half tray” (suitable for large families and gatherings…). After looking over the menu, we ended up splitting a “Papa’s Mac”, with fresh mozzarella and parmesan, sundried and roasted tomatoes, garlic, fresh basil, and pepperoni. In about 5 minutes, our freshly-made Papa’s Mac came out served in a cast-iron skillet (the back of Mr Mac’s has a larger collection of iron skillets than I’ve seen anywhere outside of a kitchen supply store). The Papa’s Mac was designed to taste like a pizza, it actually did, in a good way. For all the novelty, this was actually pretty good mac and cheese (the macaroni wasn’t overcooked, the sauce was good, and they got a good crisp to the top). I wouldn’t want this every day, but it was a rather nice little comfort food treat, executed well. As a result, I’ll be happy to give one of their other specialty macs a try in the future. 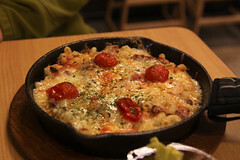 So, anyone have mac and cheese joints in their area?